An unwritten rule exists regarding academic writing: it must be dull, pedantic, and larded with long sentences and difficult words. You might think those academics who study language are an exception. But no. Unfortunately, linguists produce some of the most unreadable tripe imaginable. A devil’s advocate could argue that the difficulty of the material and the intended audience result in denser prose that will undoubtedly be more difficult for the non-expert to navigate. And in that, there is some truth. However, there are degrees of pedantry. Some writers simply have the ability to explain complex information in a straightforward and interesting way, regardless of the intended audience. Others, it would seem, are infected with a compulsion to write in a way that they deem appropriately serious. Or maybe they present their own half-baked theories in such an overwrought style so that few, if any, readers will take the time to wade through the turgid prose and question their assertions. It also takes a special skill for the expert to present their ideas in a way that will intrigue, entertain and be understood by the layperson. Guy Deutscher demonstrates that skill in The Unfolding of Language: an Evolutionary Tour of Mankind’s Greatest Invention. This book is a perfect introduction to linguistics for language teachers who may be considering a masters in applied linguistics or TESOL. It will also be appreciated by anyone with an interest in language. In the first chapter, Deutscher tells readers that, "This book will set out to unveil some of language's secrets, and thereby attempt to dismantle the paradox of this great uninvented invention." It may be tempting to think that at some point in the distant, hazy past, a group of people sat down and hammered out the grammar rules for English or any other language. However, even though Deutscher shows us in a fascinating and believable way how language evolves, the great mystery has always been how it started in the first place. Deutscher slowly leads us to the (possible) answer to that question. And along the way, you will learn some fascinating things about all languages, and English in particular. This so-called “decline” of English has always been so. Because, as Deutscher so eloquently demonstrates, the destruction of language is actually what keeps it moving forward and evolving. As he states numerous times, the destructive and creative forces are closely linked. Specifically, he discusses three main points of language destruction. First, economy. The reason why pronunciation of words changes over time is because humans are forever looking for simpler ways to speak. For example, all words in English with the “ed” ending used to have the “id” sound (i.e., like all words that currently end with a “t” or “d” sound and can take an “ed” ending—“excited” and “included” for example). Deutscher provides reams of documentary evidence of shifts of this sort that have taken place over time. Secondly, the constant desire by humans to increase their expressiveness. This results in words changing their meanings over time. It’s why we can easily accept that “wicked” can mean evil, and it can also mean “cool!” when uttered by a teenager. It is easy to understand by context exactly which meaning is implied. Over time, one of the meanings will die out, and years later, people will register disbelief that the dual meanings ever existed alongside one another. Third, analogy. Or, as Deutshcer says, all languages are essentially a pile of dead metaphors. With the exception of material things, all words we use are metaphors. Even those non-content words, “grammar words” as many people call them, started out as metaphors. This claim may strike many as ludicrous. But tell me, can you point to what an “in” is? Many would splutter and say that of course they could. Which is only an indication of how firmly ingrained our current understanding of words is. Back to the question that Deutscher posed at the beginning of the book: how did language first begin? In the closing chapter, Deutscher presents a thesis on how it all started. He begins at the point where only basic content words may have existed. He starts with the premise that the order of words in all languages adhere to a few basic rules. First, related words appear close to each within sentence structure. Second, words occur in sentences according to the chronological order of the events they represent. Third, only necessary words are included. And finally, a hierarchy of words exists in all languages, and that hierarchy is very similar, regardless of language (with “I/me” taking the top spot in most languages). Deutscher provides numerous qualifiers for this starting point. Following on that, he moves into a discussion of the development of what he calls appendagehoods—more complex language structures. His explanation is eminently plausible, and fits in with much of what he has already detailed in the rest of the book. Good non-fiction writers have a lot in common with good teachers. They don’t make assumptions, use plenty of analogies, and present their material in an entertaining way. Measured against that standard, Deutscher is an excellent writer. 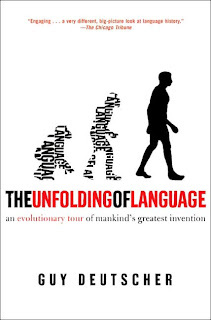 The Unfolding of Language is a great little book that language lovers will love. For those with a general interest but no real desire to go beyond some light reading, there are some passages that may cause their eyes to glaze over. However, those sections are few and far between. For the most part, the ideas and themes are very accessible. Language needs to be learned afresh by each new generation of speakers, and with each new generation the system is subjected to speakers' constant search for regular patterns. The vagaries of erosion can randomly give words a myriad of new shapes, some of which may by sheer coincidence contain elements that can be seized upon by the order-craving mind. And when speakers spot such patterns, they misconstrue these randomly produced elements as meaningful and can thus extend them by analogy to anything else that seems to fit. A great book full of fascinating ideas explained in a lively and engaging way. An added benefit for EFL teachers: they will gain a greater empathy for their students and the attempts they make to bring order to what can be a confusing language.